Rhys Patchell says he will have no divided loyalties when Cardiff Blues face Scarlets in the Pro12 on New Year's Day. The twice-capped 22-year-old Wales fly-half will join Scarlets on a two-year deal next summer. Patchell's last-minute penalty gave Blues a dramatic 21-20 Pro12 win over Newport Gwent Dragons on Sunday. "I'm a Blues player, Blues pay my wages and I will try as hard as I can until the end of the season," Patchell said. "There's a lot of games to play and I'll be proud to pull on the jersey each and every time I'm selected to play for the Blues. "It's a club that's been very good to me. "When the time comes for me to play for Scarlets I'll start talking and having [media] interviews about that." Dragons led the Blues 17-6 after an hour as Dorian Jones' boot added to Ashton Hewitt's early try. But a penalty try gave the Blues hope, and Tom James crossed moments later to close the gap to two points with five minutes remaining. Patchell missed the conversion to draw level, but he made no mistake with a penalty to stun the dominant home side. "I don't think we played particularly well," Patchell added. "We probably fed them too much with our kicking game. "The boys kept going and that's important thing because in years gone by the perception has been that the Blues give up when the going gets tough." Blues' focus now turns to the derby against Scarlets, who were beaten 27-26 in Llanelli by Ospreys on Boxing Day. 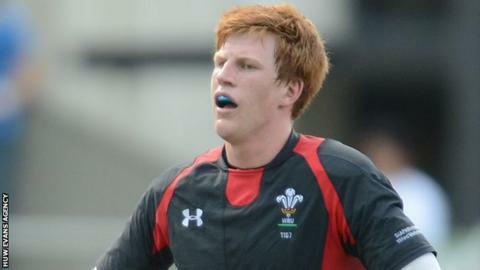 "It will be exciting for sure," Patchell said of the Arms Park game on 1 January. "They're playing some real good stuff and obviously they got pipped to the post [by Ospreys], which they will be disappointed about. "It's sets up a real cracker and hopefully we'll get a big crowd and the supporters get right behind the boys and we can put another shift in."